The most iconic monument of Hyderabad in Andra Pradesh (south India), Charminar is said to have been built between 1589 to 1592 BC (dates are not still debatable). It was supposed to be a monument to commemorate the founding of a new capital and the end of a plague. Charminar was commissioned by Muhammad Quli Qutb Shah, the 5th ruler of the Golconda Sultanate. Learn more about Chaminar at Wikipedia. Beside Charminar is the Mecca Masjid (Makkah Masjid), one of the oldest mosques in India. It is called Mecca Masjid as Qutb Shah ordered the soil from Mecca to be made into bricks that were used in building the Masjid. Learn more about Mecca Masjid at Wikipedia. 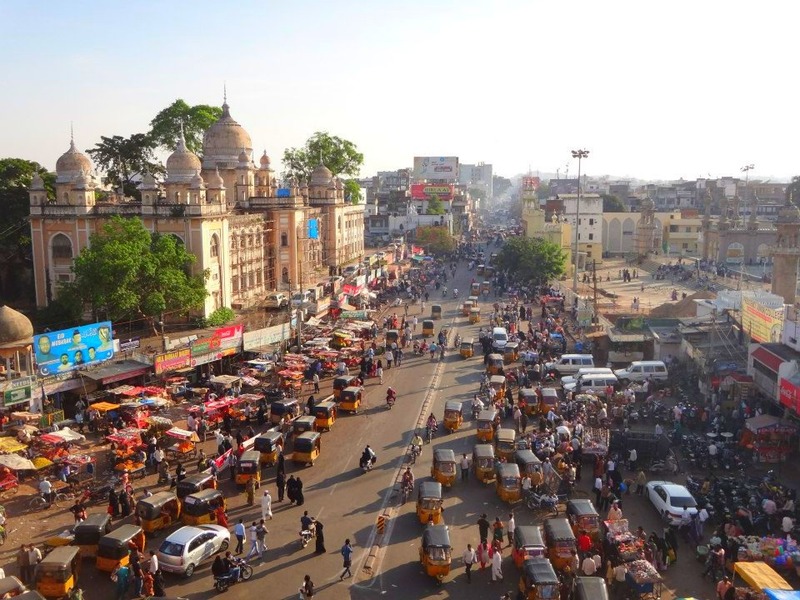 The view from the top of Charminar lets you see the other major landmarks of Hyderabad like the High Court and Patel Market (garments and pearls) on one side, Laad Bazaar (bangles market) on another, then the Makkah Masjid area, and a former palace turned into a college and hospital. Hyderabad, actually, is called the City of Palaces, among its other monikers!